I think I should write a cookbook all about brownies. I have never screwed them up yet. I make mistakes with everything - hell, even pasta - but not brownies. It's like my gift. I think that would be an awesome cookbook - all these different versions of brownies. I can never go past a good looking brownie. Now these guys are definitely good looking and delicious. They are one of the best brownies I've ever made. 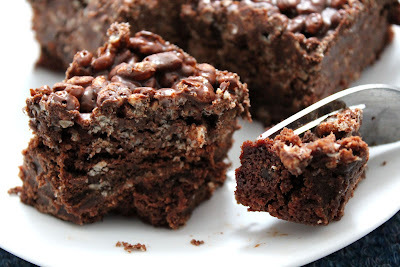 I still like my Skinny PB and Banana Brownies best, but these are a less healthier version. 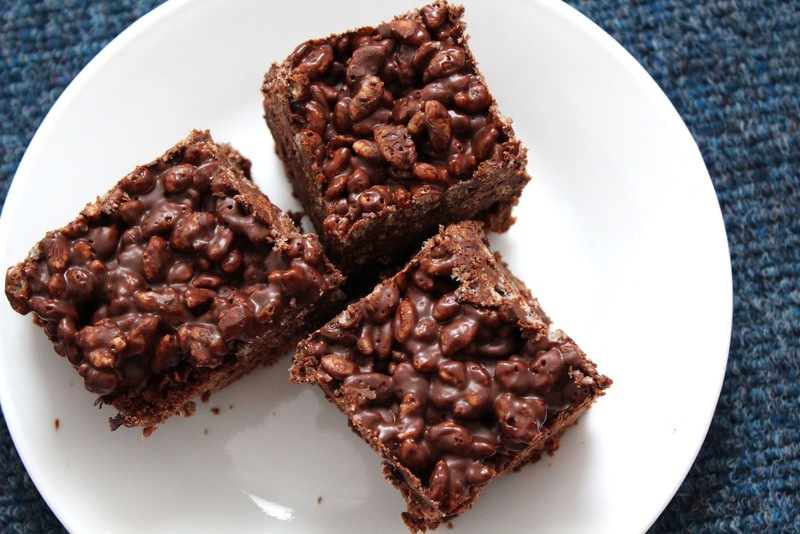 Let's not pretend these are healthy - these are decadent, rich, caramel, fudgy and crunchy, all at once. They are high class brownies - they've got everything. 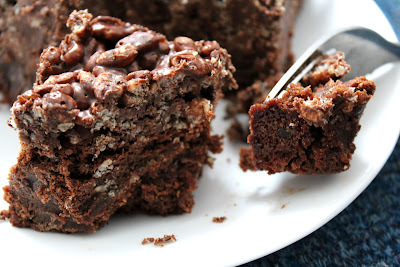 I suppose technically there are four layers to these: brownie, caramel, brownie and rice cereal top. However, I count the brownie layer as one. Both brownie layers are beautiful and fudgy, like all good brownies are. 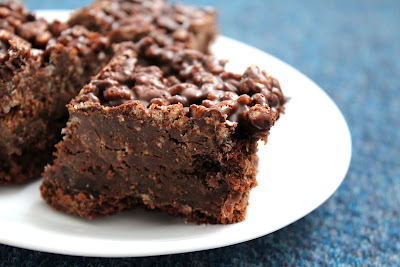 The caramel layer is not particularly strong but gently melts in the fudgy brownie so with each bite there is a hint of delectable caramel. 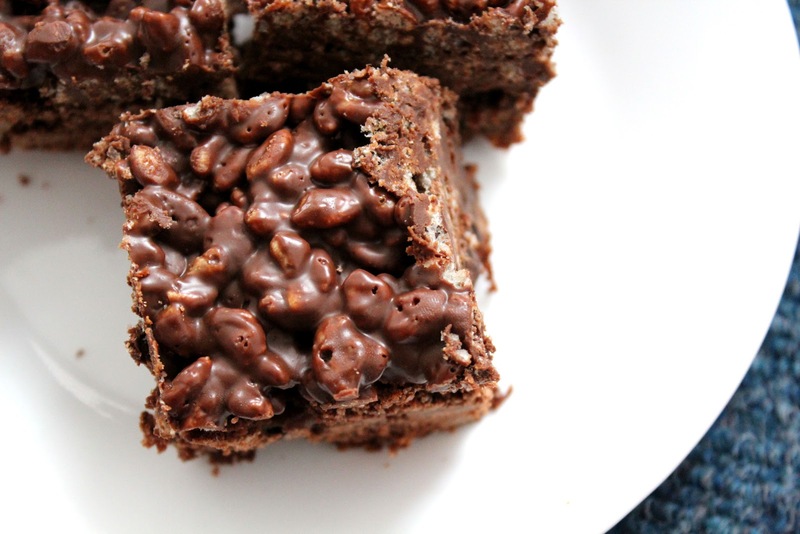 The rice cereal layer is crunchy and chocolate, with the slightest hint og peanut butter. I always think of caramel desserts as adult desserts. And I always think of chocolate covered rice bubbles as the perfect childhood birthday party treat (along with fairy bread). So this brownie is the perfect mix of an adult dessert and a childhood favourite. You can't go wrong. No really, you can't go wrong. Level of Difficulty: Pretty easy. Time consuming, but easy to make. Three bowls – not that much cleaning required. Occasion: Dessert, snack, breakfast. Who cares when – they’re that good. Menu Options: I would stick with following the recipe when it comes to this one. Maybe try inventing after you try this recipe. Preheat the oven to 200 degrees Celsius. Grease a brownie pan and line it with parchment paper. You need to do this for this recipe! Caramel is VERY hard to remove from a pan. Sift the flour and salt into the mixture and using a wooden spoon, stir the mixture together. Be careful here not to overmix the brownie batter. You want to mix until the last of the flour strands have faded. Pour half of the batter, which should be heavy and thick, into a brownie pan. Place in the oven and cook for 10-15 minutes. Reserve the other half of the batter – place a sheet of cling wrap over the top of the brownie batter so it does not dry out. Watch the brownie pan to make sure the edges of the brownies don’t burn. Remove from oven when a skewer inserted into the middle only has a little brownie on it (this is somewhere in the 10-15 minute mark). Do not turn off your oven yet! Allow the brownies to cool for 20 minutes. While the brownies are cooling, in a large bowl, melt together the caramel bits and cream. To make the caramel layer. When the brownies have cooled, add the still warm caramel layer over the top of the brownies. Spread it evenly over the surface of the brownies. Add the remaining brownie mixture over the caramel layer. Spread evenly to cover the surface of the brownies. If some of the caramel and top brownie layer get mixed together, that’s fine. Bake in the oven for another 15 minutes. Remove from the oven and allow to cool for 20 minutes. Now you can turn your oven off. While the brownies are cooling, in a large bowl melt the peanut butter and dark chocolate together, to create the rice cereal layer. I did this by placing the peanut butter and dark chocolate in a large bowl and microwaving for 30 second intervals until it was melted. Stir the mixture together so it is a dark brown. Add the rice bubbles or similar cereal to the peanut butter and chocolate mix and stir in well so they are covered by the chocolate. Spread this peanut butter/chocolate/rice cereal mix over the top of the slightly cooled brownies. Refrigerate the brownies for 2 hours or until the top layer has set. Cut into squares and serve cold. I adore rice krispies, like favorite dessert ever. I could eat them all! Bec, I don't know how you do it... but EVERY recipe you post sounds and looks amazing! I bet these would be perfect for the holidays with some green & red chocolate chips & M&MS sprinkled throughout!